Left or Right, Where's the Might? 500 Home Run Club® Members had tons of power Alright – or was it Left? When it came to choosing which side of the plate to bat from, you could say that the majority of the 500 Home Run Club® members LEFT nothing to chance - but only by the slimmest of margins. Of the 12,750+ long balls hit by 500 HRC sluggers, 6433 or 52% were hit by left-handed batters or switch hitters. Only 6317 or 48% were hit by righties. This margin is much closer than it was one year ago, since three of the four All-Stars who joined The Club in 2007 (Alex Rodriguez, Frank Thomas and Manny Ramirez) are all right handed - adding 1566 right-handed long balls to the overall count. Only Jim Thome is a lefty. 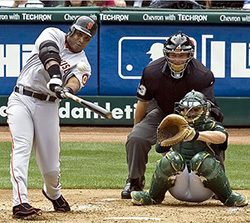 Two of the top three home run leaders of all time, Barry Bonds and Babe Ruth were lefties. And the other active 600 HR Club player, Ken Griffey, Jr. also bats facing the third base fans. While Mickey Mantle generally considered himself a better right-handed hitter, he actually hit 372 of his 536 career home runs facing the Yankee’s home dugout, while hitting only 164 as a right handed hitter. 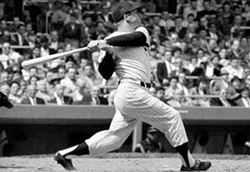 Mantle hit a home run from both sides of the plate in the same game on 10 occasions.